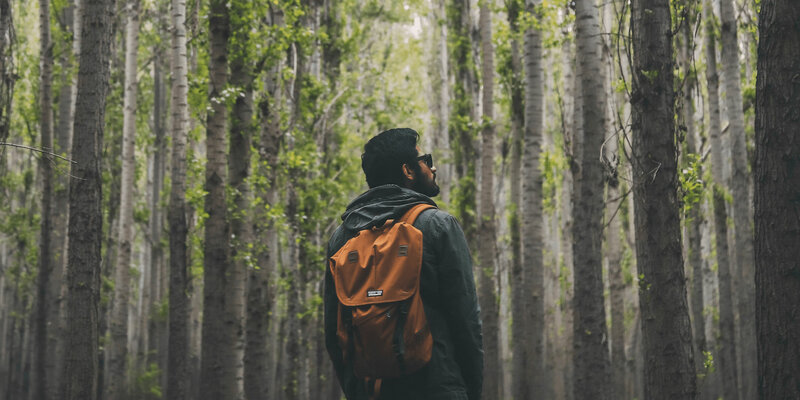 Take A Look At How Greenbelly Used Gleam To Run A Partner Giveaway And Significantly Grow Their E-Commerce Mailing List. 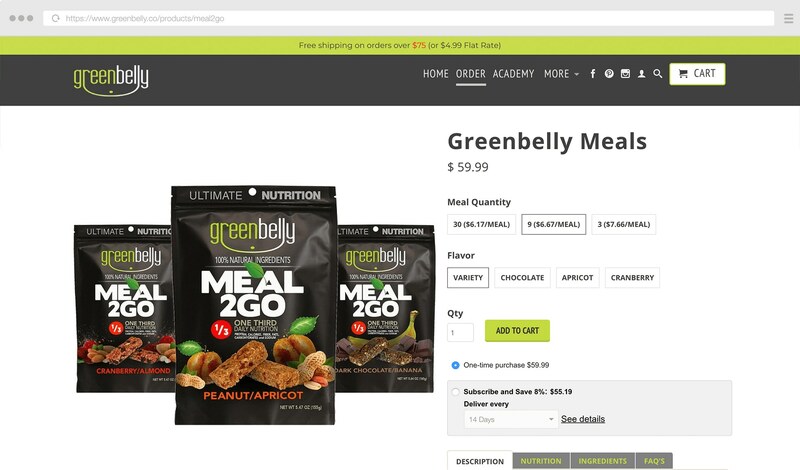 Greenbelly achieved great results on a tight budget when they used Gleam to run a partner giveaway which drove over 4k email signups and significantly increased their website traffic and sales. I get a lot of emails from customers who are just starting to grow their business asking for advice on how to drive more activity in their campaigns. The reality is that many take shortcuts, throw up a basic campaign (with a generic prize) and think that dumping budget into Facebook Ads is enough to start traction. Building a brand from scratch is hard and running a promotional campaign can be just as tough. Which is why we always recommend spending at least 70% of your build time on a solid proper promotional strategy. So what do you do if you have less than $100 and just your own time to spare to make a campaign successful? In this guide we're going to break down exactly how one of our customers, Greenbelly, managed to drive over 4.1k new email subscribers with a budget of just $75. And they didn't spend a single cent on advertising. Chris Cage quit the corporate world back in 2012 to backpack 10,000km through Asia, cycle 3,000km around New Zealand then hike the Appalachian Trial back home in the USA. One of his frustrations was being able to find food that could provide the proper nutrients during the journey. Protein bars weren't filling enough, and cooking lots of meals was a messy job. Out of this need Chris founded Greenbelly. They offer pre-packaged meals that provide 1/3 of your daily nutritional requirements (Calories, Carbs, Protein, Sodium, Fats and Fiber), and can be carried easily in your backpack. The main goal for this campaign was to drive product awareness on a budget. Chris was very familiar with many of the brands in his space, so he started building a list of potential partners. His idea was simple, instead of giving away just his own product, he would try to partner with as many similar brands as possible. Increase the overall prize value. 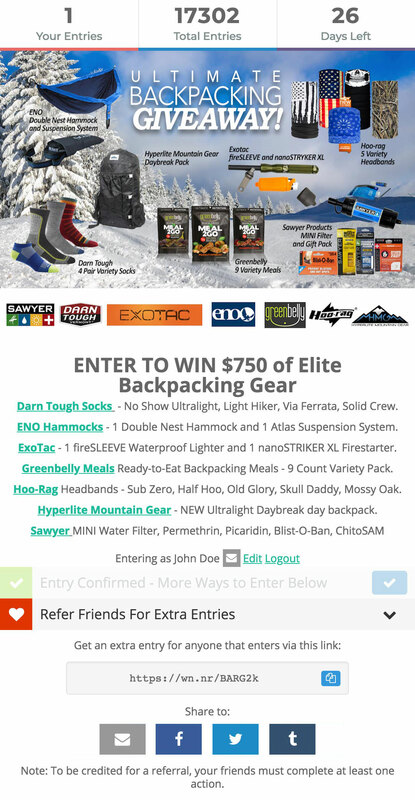 Make the prize package more desirable by including multiple products from different vendors. Get his product on the larger stage beside some of the more reputable brands. Get more eyes from his potential target market on Greenbelly. One thing to consider is that, there are plenty of other brands out there that are looking to increase their exposure just like you. Often all you need to do is reach out with an idea and you can create some great long-term partnerships that benefit both parties. Chris managed to get 8 other brands to commit to the campaign and increased his overall prize value from just $75 (of his own product) to $750. You can get an idea of all the types of products that were included in this Facebook post. The campaign itself was kept very simple with only two possible actions to complete. But, by utilising our Login First + Automatic Action features, Chris was able to drive a very high conversion rate of almost 50%. Once logged in, the focus was then getting users to refer as many friends as possible to enter the campaign. Our Viral Share action achieves this and will also auto expand (like in the example below) when it's the last action to be completed in the widget. Chris also used our Bit.ly integration to shorten all his share links so he could track clicks and other engagement via his own account. The Greenbelly campaign was much simpler than what we usually see. 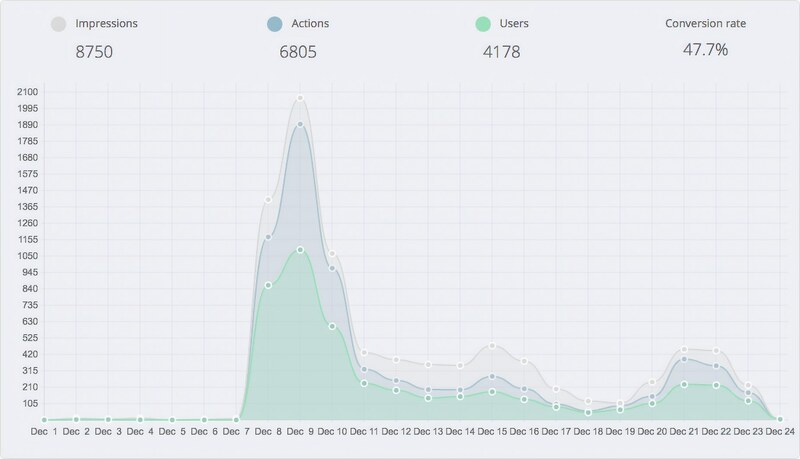 No social actions at all, it was laser focused on capturing emails and getting users to refer their friends. The campaign drove 8,750 unique impressions and converted 47.7% of those to unique entrants. The Viral Share action sent 5,428 users to the campaign landing page of which 2,628 converted at a rate of 48.3% (ideally you always want to see this conversion rate be similar to your overall one, otherwise it shows that the type of sharers you’re getting do not fit your demographics). The Viral Share action helped drive a whopping 59% of the overall campaign entrants. Needless to say this part of the campaign was a huge success. We have run several Gleam giveaway campaigns now which have, overall, grown our email list to 10,000. That email list has been fundamental in growing sales. The main goal with the email list is to provide subscribers with value and build trust. It could be a special off, discount, promotion or a sneak peek at something we are working on. We have also started created content and sharing it with our email list which has led to a 500% traffic increase a 50% sales increase. What can other businesses learn from the way Greenbelly have been run their partnership campaigns? Driving engagement around campaigns when you have a newly launched product or business (without a mailing list) can be seriously tough. I’ve seen many businesses launch a campaign, have it fail then decide to give up completely. Finding partners allows you access to engaged consumers without having to pay for them. We have a pretty good idea of the kind of brands we like working with. They need to 1) create reputable products 2) be in the similar outdoor space 3) be non-competitive. Consider products or services that complement your own, or if you’re a local business see if you can partner with other local businesses to offer something awesome for the community. You can also look at brands that you might consider partnering with to see what they’re doing in that space already. 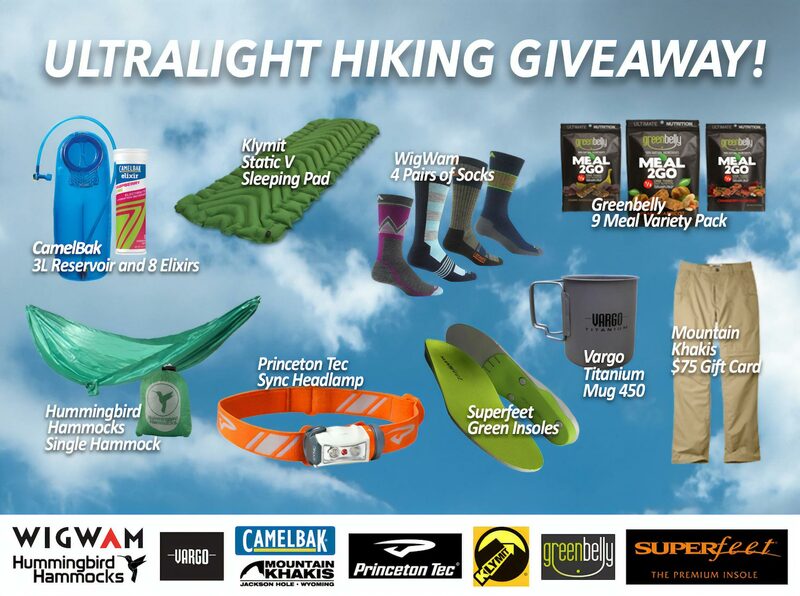 This example below is one of the brands that Chris features in his campaign, they are already partnering with lots of other brands + also getting exposure via 3rd party social accounts – which in this case is the official website for trail hiking in Atlanta. The first thing that should come to mind here is: How many other sites like this could I potentially leverage for exposure? This is a theory that we just tested with our own contest, it worked so well that we surpassed our previous entry volumes in just 48 hours. But why does it work well? It opens up new markets to target. It allows you to theme your campaign to suit particular demographics of users. This in turn makes it easier to target the right users. It also makes it easier to partner with the right companies, brands or influencers. You drive the overall prize value up, which creates more desire. You can tier your prizes to offer more incentive to enter (so not only the overall winner gets something). 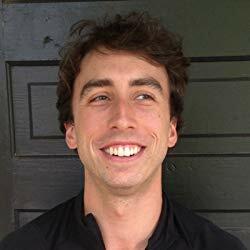 Chris created a simple email script that he used to contact his pre-qualified list of brands. Once he got a reply he could then talk specifics about the campaign, what their involvement would be and how the data or actions might be shared. Are partners required to share the campaign to a specific schedule or not? Do you share actions inside the widget with partners? Chris decided that he didn’t want to share the emails with partners, and he didn’t ask them to promote the campaign in a specific way – just however they felt was natural. If you can get partners to announce the campaign to their mailing list then you should absolutely ask that question. Partners with large lists are worth their weight in gold. Prize packs and working with partners allow you to think about targeting specific types of users by theming your campaigns. 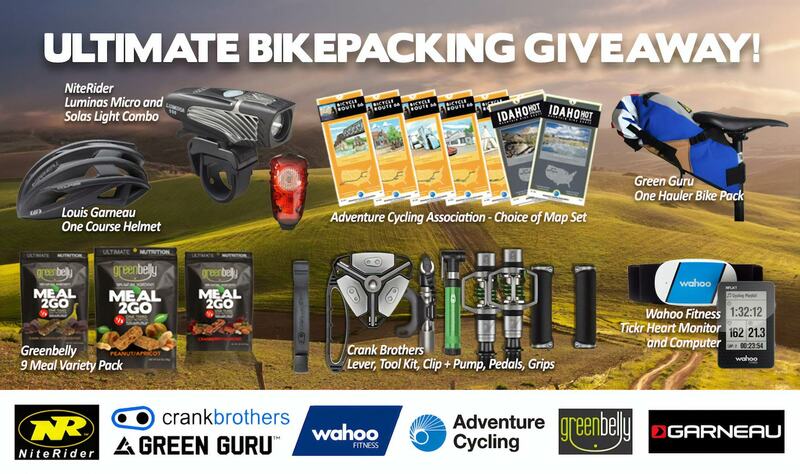 To date Greenbelly have launched 4 different campaigns targeting different audiences: Biking, Hiking & Backpacking. Each audience type allows Chris to reach out to different brands and explore different avenues for marketing. Since he has a product that is useful for people, each market that he targets starts to give his product penetration – which in turn drives sales. He might come across some strange undiscovered market that he’d never thought about. Viral mechanics can be hit and miss, very rarely does something actually go viral without a perfect storm of ingredients. We have a pre-built Viral Share template which creates a unique shareable link for every entrant. All they need to do it click the buttons to share to their favourite network or grab the link, then when someone enters they’ll get credited for the entries. Once you have this action enabled there other things you can do to influence how shareable your campaign is, and when shared how likely the recipients who see it will considering entering. How badly does the user want to win your prize? Is this something I’m happy to share with my close network? If shared will it reach a similar audience? Or will it be too broad and get lost in the noise? Will referred users convert at the same rate or better than normal entrants? In Chris’ campaign he knew that if he made the prize audience very specific then it would be shared amongst like minded people – people who hike or people who bike will tell their friends that share the same hobbies. Consider something non-targeted like a $100 Amazon Gift Card, it’s too generic to be relevant via shares for many.